On Thursday we welcome our Bishop Paul Williams to confirm candidates, young and old, into the Eucharistic fellowship of Christ’s church. We also welcome candidates from our sister churches of St Philip and Christ Church. When the Church of England is supposed to be in terminal decline, this is a wonderful expression of the vitality of our church and we’re moved that so many wish to stand up and make this public profession of their faith. This is NOT a private service for the candidates’ families and friends: it is one of the most important services in our church year, involving all our resources of inspiring worship, including wonderful music, and the Wardens and clergy consider that ALL committed members of St Mary Abbots should be there, to welcome the Bishop and support those joining our Eucharistic fellowship. This informal Eucharist, simplified and accessible to all, is especially offered for those who work on and around Kensington High Street. Throughout these Lenten Mondays we are exploring Bishop Stephen Croft’s Lent Book EXPLORING GOD’S MERCY. ‘Mercy’ is a concept frequently invoked in the Bible and in church – but what is it, where do we find it and how to we bring it to others? All are welcome – the service is followed by a light lunch and an opportunity for discussion and fellowship. 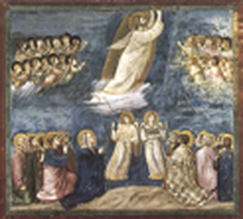 This Thursday, 2nd June is Ascension Day. Celebrating how Jesus, his work of salvation complete, returns to his Father in heaven: now his work and ministry is left to his disciples – to US – to complete! A special service at the top of our tower (not the top of the spire!). Those who can’t face the hundreds of spiral stairs are welcome to gather below and cheer us on. Afterwards coffee and croissants for everyone in the Vestry. Nb The spiral stairs are difficult to negotiate for anyone suffering from poor sight or claustrophobia or short breath, and the tower parapet has spaces a child could fall through – so it’s fit adults only (+ the Clergy) for the climb, please. Whatever your age & fitness you are welcome to join us (see above) & share breakfast! All who seek an evening Sung Eucharist are warmly invited to climb up Notting Hill and join our friends and neighbours at St George’s, Aubrey Walk, W8. There will be splendid music as always, and the distinguished visiting preacher will be The Rev’d ROB MARSHALL, (you may have heard of him). We are promised that afterwards St George’s magnificent Refreshments really will be available for all to share this time (on their Patronal Festival the caterer forgot……. )!